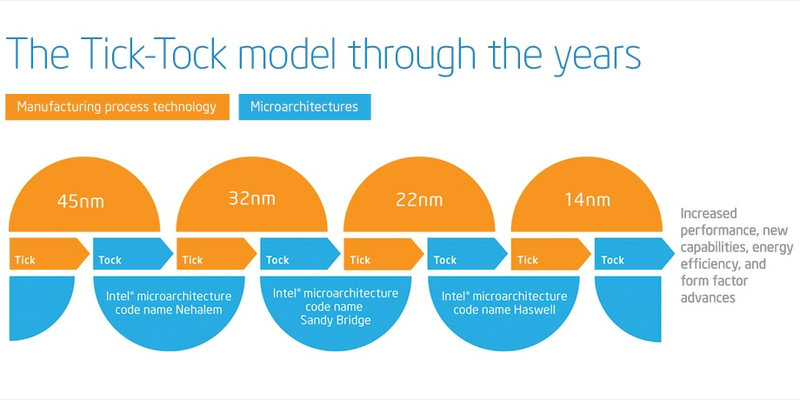 Intel releases a new processor microarchitecture every two years, which is called a Tock release. One year later, they take that same microarchitecture and move it to a new, smaller manufacturing process, along with adding some minor feature improvements. This is called a Tick release. Table 1 shows the recent and upcoming Tick-Tock releases. Figure 1 shows the Tick-Tock release relationship, with the Tocks in blue and the Ticks in orange. The next major Tock processor release from Intel will be Haswell. Haswell is the next Tock release after Sandy Bridge. Haswell is supposed to be released for the desktop and mobile space in the March-June 2013 time-frame. Based on past experience, that probably means that we will see the server oriented Haswell-EP and Haswell-EN server microprocessors show up one to two quarters later in 2013. According to various Intel roadmap slides that have been leaked, Haswell-EP will have 10-14 CPU cores, with 2.5MB of L3 cache per each core, for a total of up to 35MB of shared L3 cache for the entire processor. The Haswell-EP processors will also have a quad-channel DDR4 memory controller, supporting transfer speeds 1333, 1600, 1866 and 2133 MT/s. They will also have two quick path interconnect (QPI) channels, and PCI Express 3.0 with 40 lanes on Haswell-EP, and 24 lanes on Haswell-EN. They will also support Hyper-Threading and Turbo Boost. If this is true, you could see up to 28 physical cores or 56 logical cores in a two socket server with Haswell-EP. If Intel continues what they started with Sandy Bridge-EP, there will also be a four socket version of Haswell-EP that would have 56 physical cores or 112 logical cores in a commodity four socket server by late 2013! Since Haswell is a Tock release, we can expect a big performance boost over Sandy Bridge. Historically, Tock releases have shown anywhere from a 50-100% performance increase for various workload types. Haswell requires a new processor socket and different chipset, so the server vendors will have to release new model servers (for example a Dell PowerEdge R730) to accommodate it. This is pretty exciting stuff! This entry was posted in Computer Hardware, Haswell, Intel, Processors and tagged Haswell-EP, Tick-Tock. Bookmark the permalink. Exciting … Until you have to pay a SQL Server Enterprise core-based license. 😦 Microsoft is going to have to address that in some way as it is unsustainable for companies like ours to see licensing prices skyrocket so quickly. It’s not like CPU is the bottleneck for most SQL applications. It should be possible to select a Haswell processor that has fewer cores, but a higher clock speed to minimize your SQL Server license costs. Not if you are looking at 10-14 core CPU’s. Is there any detail on smaller core sizes for Haswell? To put in reference we are looking at a EA with 20 CPU’s that are running as follows – 6 are on 4-core processors and 14 are on 10-core processors which takes us from the equiv of 80 verus 164 cores. If you do the math it is looking very expensive and have shops like mine looking to minimize core count. Nobody but the executives at Intel knows exactly what their plans are for Haswell. With Sandy Bridge-EP, you can get an eight-core E5-2690 as a “top-of-the line” processor or you can get a four-core E5-2643 to minimize your SQL Server 2012 core license costs. You can do a similar thing with the E7 line by picking a 10-core processor, or an eight-core processor to reduce your license costs. These lower core count processors typically have a higher base clock speed, so you should see improved single-threaded OLTP performance as a bonus. You do give up some scalability with lower core counts. I would guess that Haswell will follow the same pattern.